Jignesh Shah is using technology to deliver the benefits of globalisation to the masses. His is yet another rags to riches story; the archetypal middle class boy who has made it big. But Jignesh Shah’s tale stands out, not because he himself has become fabulously rich, but because he has adopted a model that while enriching himself as a byproduct, has enabled thousands of people, and society itself, to create enormous wealth. And, by all accounts, one can expect more of the same in the years ahead. Shah, who founded the Multi Commodity Exchange of India (MCX) in September 2003, loves to prattle about his new “babies”. Sitting in his 6th floor Boston House boardroom in Chakala, off Mumbai’s suburban Andheri (East), he says: “I consider myself to be a technology scientist,” and passionately goes on to explain how he is using technology and innovation to create next generation financial markets for the masses. “I’m off MCX now,” he says, and switches to subjects like energy, logistics , mobile technology and foreign exchange. Even as he holds forth on a stream of new business ideas, this electronics engineer from the University of Mumbai says he is actually only thinking aloud. MCX replaced the age-old regional commodity exchanges by offering a nationwide electronic trading platform for futures trading in both agricultural products as well as metals. Statistics roll effortlessly off Shah’s tongue. It is evident that this unassuming man, who will turn 41 in January 2008, is charged up. And with good reason—he has already struck gold in all the three ventures he has incubated over the last three years. “I’m like a scientist researching in a laboratory,” says Shah, who is Chairman & Group CEO of Financial Technologies (India) or FTIL, his right hand firmly on the remote alarm (he keeps calling his secretary to fetch papers from his table in the next room). He has put on a little weight since this correspondent met him last year, but otherwise, the script is similar. He is working on the next big idea in his “laboratory”. “There are several more, but I’ll tell you about them at an appropriate time,” he says with a smile. This time around, he wants to talk about India’s first power exchange, Indian Energy Exchange or IEX. “Energy is at the heart of industrial growth, but there’s a huge demand-supply gap,” says Shah, who set up this venture only in August, 2007. In all probability, IEX will be up and running in 2008. Like his earlier ventures, IEX is positioned to usher in a revolution in the energy market by enabling price discovery in an automated environment. Shah then quickly moves to an altogether different territory— inclusive growth, a term politicians and the leaders of India Inc. often use these days. “You may find hundreds of new billion-dollar companies in the stock market, but if you don’t involve 100 million people, the growth has no meaning in a country of a billion-plus,” he says, launching into a fervent explanation about ATOM (Anytime Transactional Mobile) technology that he is test piloting with leading banks in India. “The mobile phone is the easiest way to reach the masses,” says Shah. His ATOM technology is aimed at hassle-free secured shopping with a mobile handset (users don’t have to keep multiple credit or debt cards or cash). The technology allows them to load all the cards or money in a mobile handset. “The mobile phone will become the new point of sales,” he explains. It’s like a virtual credit or debit card loaded on your mobile phone which you have to produce or show to the merchant establishment (shop or a restaurant) after writing the payment details. The merchant, in turn, scans the encrypted mobile details (just the way they swipe cards in a machine) and the whole transaction will get completed in a couple of seconds. “Our whole DNA is to create markets in every asset class and attack the inefficiencies in the system,” says Shah. That’s high praise from the high priest of Indian finance. And it’s extremely well deserved and hard earned. Shah has grown from working as an Assistant Manager in Bombay Stock Exchange (BSE) to one of India’s leading young entrepreneurs. When he started out, he was up against Asia’s oldest bourse, the BSE. “Not many people took me seriously then,” says Shah, who had to run from pillar to post to get the licence for his commodity exchange. He is yet to take MCX public as the government is still working on regulations for commodity exchanges. But the likes of Fidelity International, Citigroup, Merrill Lynch, ICICI Bank, IL&FS and Kotak Mahindra have all invested in it—a pointer to the trust these hard nosed financial giants have reposed in the emerging architect of online commodity trading in India. Reason: The founder of Sasken Technologies could challenge Shah‘s position in the technology IPR space. Mody is also following an IPR-based model of innovation in the telecom software space. Sasken provides R&D consultancy and software services to many leading global companies in the technology space. Reason: Gehlaut’s Indiabulls Financial Services is setting up a commodities exchange in India in partnership with MMTC. 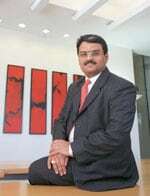 His company, which has a market cap of close to Rs 20,000 crore and a net worth of Rs 3,800 crore, is wellplaced in the financial services business to move onto the next level of managing a commodity exchange. He followed this up with the Dubai Gold & Commodity Exchange (DGCX), a 50:50 JV founded by him in partnership with Dubai Metal & Commodity Exchange, two years ago to take advantage of the critical time zone (between markets in Europe and the Far East). DGCX is valued at half a billion dollars, and its success has provided a global platform for Shah to showcase his skills to a wider audience. “We have been invited by many countries like Malaysia, Mauritius and some West Asian states to set up exchanges there,” says Shah proudly. His flagship, Financial Technologies, through which he exercises control, is alreday valued Rs 12,000 crore and his personal stake in FTIL is valued at over Rs 2,000 crore, but Shah remains a simple man. His father, Prakash Shah, was a small-time iron and steel trader and moved to Mumbai from Gujarat in 1963 in search of his fortune, and Shah was born and brought up in the city. Today, despite his wealth, the only luxuries in Shah’s life are a Mercedes Benz S Class and a house in Mumbai’s ultra-hip Juhu area. But he still uses a Toyota for his daily commutes as “it is faster than in a Mercedes” in Mumbai’s chaotic traffic. Looking back, Shah admits that the BSE job was a blessing. The exchange was then toying with the idea of phasing out the open outcry system with an online trading one. “It was a once-in-a-lifetime opportunity to be part of the makeover,” he admits. But it was still a big call to sign up, especially as many of his friends migrated to the US or joined Indian software companies. “I took the decision after much thought,” says Shah, who was always set against becoming a code jock. What worked in his favour is the lethal combination of technology and a sharp mind. The short stint in BSE took him to the world’s best stock exchanges in the US, London and Tokyo. “I refused a job offer from Merrill Lynch along the way,” says Shah. Today, Merrill Lynch is a shareholder in MCX. He fondly remembers the early days when he started FTIL from a cramped 250 sq. ft office in South Mumbai’s Fort area, with Rs 5 lakh that he raised by mortgaging his flat, and a dozen employees. “We took on biggies like Tibco, IBM and TCS head on,” says Shah, who, by 2001, came to dominate the trading software space in India with a 90 per cent market share. His MCX was a success story from day one. “MCX today is the most powerful brand,” says Shah. Now, with an eye on expanding in the commodities market, which is 10 times larger than the equity market globally, Shah is spreading his wings. The National Spot Exchange (NSEAP) is creating a parallel electronic market for spot trading in agricultural commodities. “We have already got the go ahead from the government of Gujarat; and half a dozen others are readying to go live with us,” he says. There is also a National Bulk Handing Corporation (NBHC), which provides technology to warehouse owners to manage agricultural commodities. This venture will support the needs of MCX brokers and facilitate spot deliveries. “This venture is already matching MCX in terms of revenue projections,” he discloses. Then, Shah is also equally excited about the foreign exchange market, but is waiting for a relaxation in regulations and a regime that allows fuller capital account convertibility. He already has an online interbank foreign exchange trading platform for banks and FIs. What makes Shah’s overall game plan, of providing trading platforms for a variety of assets, formidable are the possibilities in the mobile space. As we have pointed out earlier in this profile, he is “piloting a project to substitute cash and cards (debit and credit) with a mobile platform”. But he’s also thinking ahead. The common thread running through all his ventures is that they provide people easily accessible platforms on which they can engage in price discovery of products and then, if they so desire, trade in them. His systems enable and empower users by demonstrably reducing inefficiencies in the system. Now, he is planning to take these strengths to different verticals. The vision is tantalisingly audacious. But given his track record, only the foolhardy will dismiss them as mare’s nests, but can he really change the lives of India’s masses with trading technology? Watch this space.